A rapidly strengthening storm will move across northern New Brunswick before heading north of the Gulf of St. Lawrence on Saturday. As the storm rolls through, much of the Maritimes will experience rainy and windy weather to start the weekend with accumulating snow for parts of New Brunswick. The inclement weather begins with increasing cloudiness Friday evening and night, but it isn’t until early Saturday morning when the first of the snow and rain arrives. The initial rain-snow line looks like it will set up generally from McAdam to Miramichi in New Brunswick, with more snow west and north of the line and a quicker turn to rain east and south of it. Snowfall amounts of 8 to 15 cm can be expected from Woodstock to just west of Bathurst and then back into the northwestern corner of New Brunswick. Some amounts may exceed 15 cm in the higher terrain towards the Mount Carleton area. Other areas of New Brunswick may see a few to several centimetres of snow before a turn to rain. It is possible that there may be significant variation in snowfall amounts even within relatively small geographic areas due to the nature of the mix. As for the rain, much of southern New Brunswick, Prince Edward Island, and Nova Scotia are forecast to receive 15 to 25 mm with amounts of 25 to 40 mm possible near the Bay of Fundy coastline in New Brunswick and the Atlantic coastline of Nova Scotia. 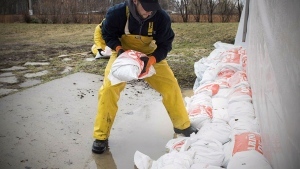 While most of the rain forecast is below warning criteria, the ground in the Maritimes is saturated by water so there will be increased runoff and pooling water. The snow and rain (or mix of both) is expected to clear the region Saturday evening and night. Wind will be a factor with this storm. Generally east and southeast winds will increase to include gusts of 40 to 70 km/h through Saturday morning. 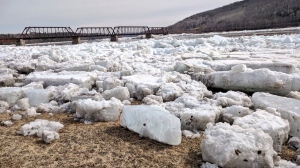 By Saturday evening and night they will turn southwest and include gusts of 50 to 80 km/h with gusts exceeding 100 km/h in northern Inverness County, Cape Breton due to the topography of the Highlands. In the wake of the storm Sunday winds will turn west but continue with gusts of 50 to 80 km/h. These winds are high enough that you may wish to check in on bridge and ferry services in the event of restrictions or delays. They are also high enough that there will be risk of power outages. Power outages may also be possible due to collecting heavy wet snow in western and northern areas of New Brunswick. The weather for Remembrance Day, which falls on Sunday, will be windy and cold. Temperatures at 11 a.m. on Sunday will range from minus 4 C to 1 C for New Brunswick, near 2 C for P.E.I., and 1 C to 4 C for Nova Scotia, with the wind adding an extra bite to the air; plan on dressing in layers for the ceremonies. Weather conditions will be a general mix of sun and cloud. 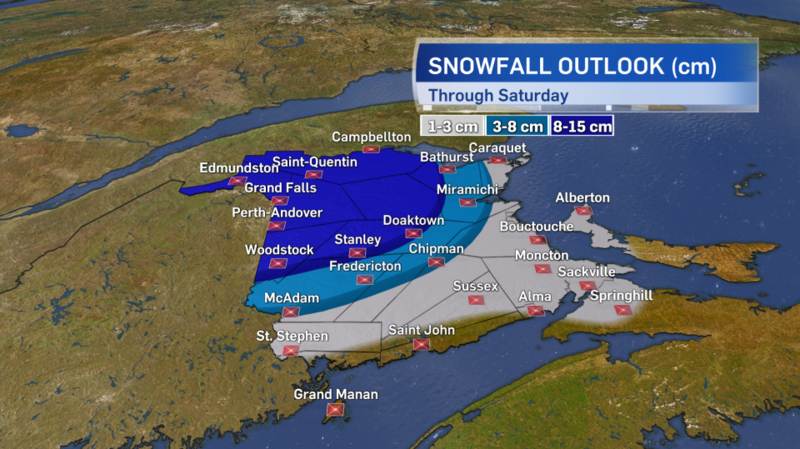 Here's the snowfall outlook for parts of New Brunswick on Saturday.